No matter how long you've been driving, it's never too late to learn better habits. Automatic is a little Bluetooth dongle that plugs into your car's OBD-II port (found on almost any car made since 1996) and communicates with your phone to track driving habits, mileage, and engine problems. Best of all, if you're in an accident, Automatic will automatically alert the authorities and call your family, no subscription required. If you use your phone a GPS or audio player in your car, you need a good dash mount. Amazon's Gold Box deal has a couple of options from Mountek on sale today, including a CD slot mount that was one of your five favorites. Whether you want an iPad Air or an iPad Mini with Retina Display, there are some solid deals for you today. 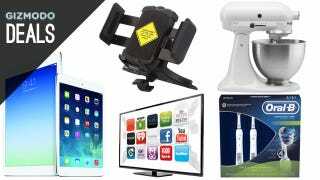 Computers, tablets, and TVs galore highlight Monday&apos;s best deals. 2-Pack Oral-B Professional Deep Sweep 4000 Rechargeable Toothbrush ($65) | Walmart | Includes two brushes, two replacement heads, two cases, and two chargers.